Barrel: 18" 416R stainless steel barrel, chambered in .223 Wylde, with a 1:7 twist, M4 barrel extension, and a rifle-length gas system. The barrel is finished with a .750" diameter low-profile gas block, PSA 15" Lightweight M-Lok Free Float Rail and an A2 flash hider. Upper: Forged 7075-T6 A3 AR upper is hard coat anodized black for durability. Featuring M4 feed ramp cuts, these upper receivers are made for us right here in the USA. Bolt Carrier Group: For AR15 and M16 rifles and carbines. Bolt is made of shot-peened, Mil-spec Carpenter 158® steel. Gas key is secured with grade 8 fasteners and staked. Includes Charging Handle. BEST ANSWER: The upper will be assembled. The lower can't be assembled without a receiver. It's easy and fun to do. There are many complete assembly videos on youtube. No it does not come assembled, the upper will come assembled, you will still need to purchase a lower and assemble it or have it assembled. 5.56 can be used without issue? Sure this is an 1:7 twist barrel and not an 1:8 twist? I wouldn't trust them.... dirty scoundrels!!! Will there be any issues shipping this to NY? BEST ANSWER: They can ship it to NY. Can it be shipped to California ? BEST ANSWER: Yes,I bought one, you'll get more than you pay for.its the best deal I've see on psa so far and I've bought 3 different rifles from them so far. Am I correct in assuming this only needs a stripped lower receiver to be complete? BEST ANSWER: A lower. The tools and the time. Can you shoot 5.56 out of this set up? BEST ANSWER: Yes, the .223 Wylde is designed handle 5.56 and .223. It is supposed to be more accurate with the Wylde chamber. It has ran great for me. Yes, you can shoot 5.56 and .223 through this setup with great out of box accuracy. Yes. The .223 wylde is "optimized" to shoot both 5.56 NATO and .223 Remington. Could you use this to convert your ks-47 to 223? Is this considered a heavy barrel that could be shipped to Maryland? Does this upper have a qd sling port on the mlok rail? Whats the difference between this upper and the upper with sku# ending in 448754? Obviously besides this coming with lower parts. Can this rifle kit be shipped to a PO Box in Idaho? Very nice upper and quick shipping too. Product shipped on Monday and received the package the following Monday in southern California. Came with all parts needed to complete rifle except lower receiver. No missing parts. This is my first build and i love this upper. Very well packaged with foam inside of the box. Sights were easy to put on. BCG is oiled up. There were a few very minor scratches on the handguard but they're really not noticeable unless you're going out of the way to really look for them. Has ".223 Wylde " engraved on the barrel. Psa logo under the handguard. Super clean looking upper. .223 Wylde with M-lok is the way to go. Giving this item 5 stars even though it hasn't been shot through. 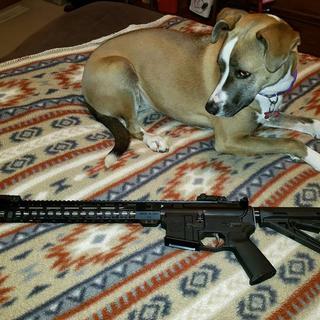 I will leave another review and rating once I take it to the range. I got this kit for Christmas and built it on an Aero Precision lower that i got from my local store. the kit went together pretty easily considering that I'd never built an AR before and had only basic tools. I added a red dot and took it to the range with a variety of .223 and 5.56 ammo and only had 1 or 2 user-induced issues. I have not tested any steel cased ammo in it yet, but am very happy with how it shoots. The reason i didn't give 5 stars is that i haven't had a chance to shoot it outdoors past 50 yards, so I don't know exactly how accurate it is at distance. I think this was a great value for anyone who doesn't mind spending just a little time to build it. I just put this together on an Anderson lower, so far I love it! I shot 20 rounds out of it freehand at 50 yards with the Magpul sights and had about a 3 inch group. I am happy with that group so far as I wear bifocals and the group is me, not the gun. It looks beautiful, fit and finish is very nice. The recoil is very soft due to the rifle length gas tube. The only reason it doesn't have a 5 star rating (yet) is because I want to shoot it thru a sled and see how accurate the 1/7 barrel is.